I arrived at the turning point in the steps between the outer and inner dome of Florence’s Cathedral. As I climbed, the dome’s angle of ascent decreased to 45 degrees, so now the stairway turned 90 degrees and followed the vault’s ribs directly to the center. 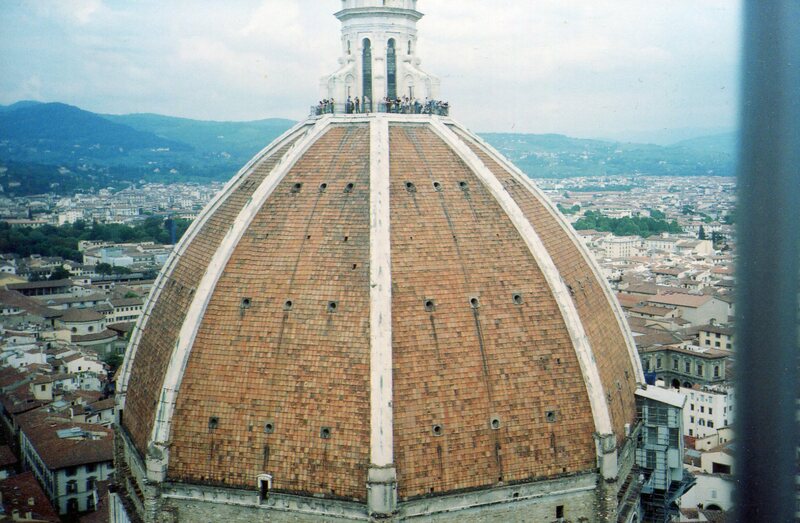 It was so cool to be between the two massive domes which were built almost 600 years ago. But when I reached the observation platform, I had a revelation. 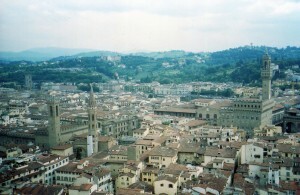 From the observation deck, I could survey all of the area of Florence from the Renaissance. I had to remind myself that the building was finished way back in the mid 15th century because I was high enough to be in a modern skyscraper. I was higher than Angkor Wat’s central tower. The great Suryavarman II would have been green with envy. Mere merchants and craftsmen built a higher temple than he could have. 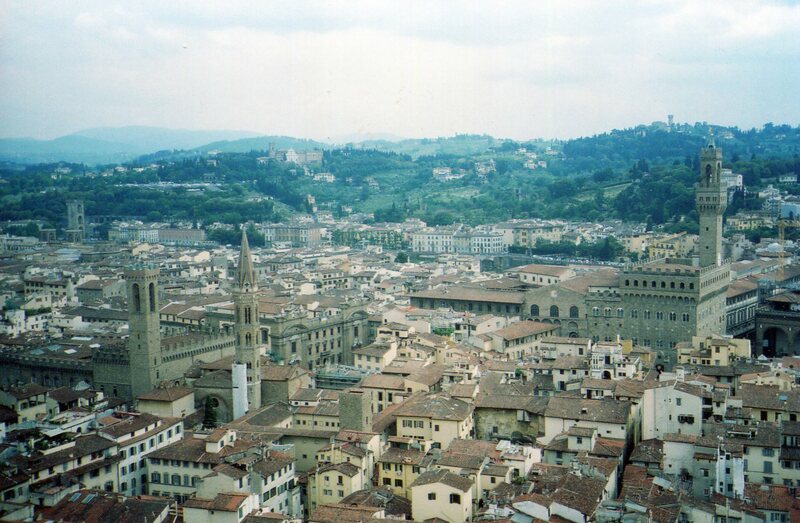 The people who saw this view in the 15th century enjoyed the best of 2 worlds. Geometry and engineering raised them to the gate of Heaven. Technologies that helped usher in the modern world brought them to threshold of the celestial worlds which people in the Middle Ages hoped for. This use of static geometrical forms from ancient Rome to raise people to the heavens reinforced the idea that these shapes are divine. As Florence began to lead Europe into the modern world, its people could believe the ancient Greek assumptions that permanent geometrical shapes are basic in reality. Half a world away, the Khmers had used ideas of flows of divine energy that all life came from into designs of their great temples. For them, and for many Southeast Asian cultures, flows of nature’s power that are too fecund to be reducible have been more fundamental than abstract shapes. The last few posts have explored some of the dimensions in their ideas. The next few will explore Western thought. I’ll show you that each culture’s assumptions of what’s basic are infinitely rich. As you read more of my posts, you’ll be able to see how infinity can be seen as fundamental in our globalized world. Want a headstart? Comparing the West with concepts behind Chinese architecture will set you on your way.